Over the past 10 years or so, Jeff Burke has become one of my favorite songwriters and easily one of the most reliable people out there when it comes to putting out records that I like. I became a fan when the Marked Men record On The Outside came out and watching his bands gain popularity since that moment has been a really wonderful thing to see. The clear vinyl version of this record sold out in about a day and Dirtnap did 500 copies of that version. While I realize those aren't the kind of numbers that will be impressive for gigantic bands, to me, that sounds like a good amount of records for a punk band from Texas to be selling. Silent Kill is the second Radioactivity full length. Like it's predecessor, it builds on a foundation of fast downstroke heavy guitar, extremely dynamic chord changes and Jeff's howling in the wind vocals. Unlike the first Radioactivity full length, there's more slower songs (well slow in comparison anyway) that showcase a different side Radioactivity. These songs aren't some new weird maturation process or anything, they are still cut from the same cloth as the two thousand mile an hour rippers, but they give the album more depth and show that Jeff doesn't only rely on lightning quick guitar to build a catchy hook. 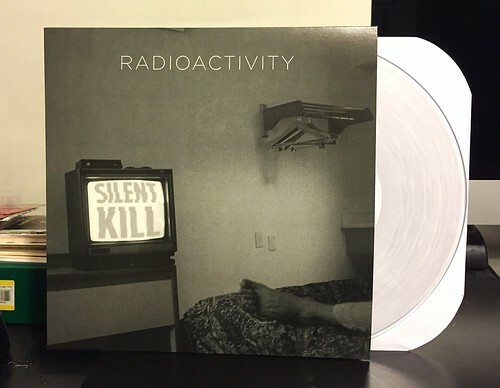 Silent Kill is every bit as great as the first self titled Radioactivity album. You can hold it right up next to the best Marked Men records and still be impressed. Sometimes I think the drumming could use a little more flair, it has something of a metronome quality to it, but these songs are just so expertly crafted it is impossible to not have them lodged into your brain all day long after you've had a listen. I just saw them a couple of weekends ago in Austin. They were great! Not as wild as The Marked Men show I saw the year or so before but still great music. Every song was strong on its own. I can't wait for more.